Dare To Compare And Price Match Your Next Tire Purchase At Sam's Club! You are here: Home / Sponsored / Dare To Compare And Price Match Your Next Tire Purchase At Sam’s Club! 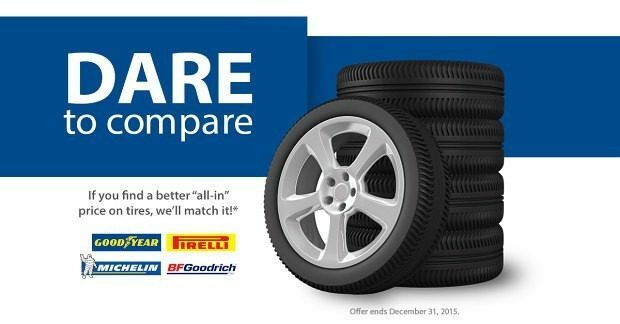 Dare To Compare And Price Match Your Next Tire Purchase At Sam’s Club! This post was sponsored by Sam’s Club and I was compensated to write it. Regardless, what I have written is my own opinion and experience, and I hope you find it of use. Our 17 year old son often wants to show that he’s grown by doing things without consulting us so that he can later tell us the great thing he did. Well, recently he bought four new tires for his car… he had 1 flat and that’s what he went to replace and was then convinced he needed all new tires (then 2 weeks later sold his car :/) Had he talked to us first we would have told him where to go for his new tire and also explained how the salesperson might try and talk him into more. But, I recently learned that Sam’s Club will price match tires! That’s a pretty cool offer! prices on tires, but they offer a great value on their Tire Installation Package* ($15/tire, $25/dually tire). serviceable wheels and install them on your vehicle to the manufacturer’s specifications. usable life of the tire (2/32nds tread remaining). no cost to the member for the usable life of the tire (2/32nds tread remaining). bruise, impact break or puncture, whether repairable or not). 24-hour toll free access for emergency tire change service. Please see the Dare to Compare site for more specific details on this offer! Sam’s Club savings! You will not want to miss this $500 Sam’s Club gift card grand prize giveaway. Must attend party to win, winners announced throughout party. So, if you’re looking for tires now or will be soon, check all the prices and then head over to your local Sam’s Club to match that price!